Whether you're going low carb or just trying to lighten up your daily routine, these remixed recipes will become dinnertime staples. If you're a fan of hearty, cheesy and creamy Italian dishes (and let's face it, who isn't? ), but you’re looking for some healthier options that won’t ruin your diet, I have three simple tricks that will still allow you to enjoy versions of your favorite comfort foods, yet they all have the same great flavor as their traditional counterparts. 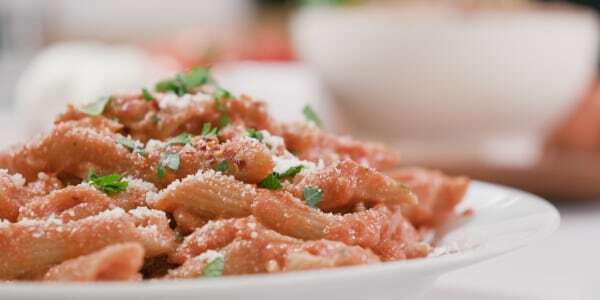 First, you'll flip for my lightened-up Penne alla Vodka pasta: it's rich, decadent and incredibly satisfying. If you're looking for a low-carb meal, try these delicious Chicken Parmesan Meatballs over spaghetti squash. 1. Be clever with carbs. Say "arrivederci" to white noodles and try whole grain pasta varieties for an extra boost of nutrition and fiber. Today, you can also try pastas that aren't made with wheat at all but instead use ingredients that have more fiber, more protein and are lower in carbs like lentils, chickpeas and beans. There are lots of great brands on the market. I like Banza, Ancient Harvest's Pow! and Tolerant. Spaghetti squash and spiralized zucchini noodles (aka zoodles) make a perfect low-carb substitution for pasta. You can also mix a big serving of veggie noodles in with your whole grain pasta to bump up the volume (try a 50/50 split). The end result is one heaping bowl of comfort food for a fraction of the calories and carbs. Also, try tossing spinach in to whatever sauce you're making while it's simmering on the stove for an additional boost of nutrients and volume. 3. Get creative with creamy sauces. Instead of using heaping amounts of heavy cream, butter and flour to make traditionally thick cream sauces (I know, I know ... I love a delicious Alfredo sauce, too! ), think outside the box. To get a creamy, indulgent sauce, utilize lower-fat ingredients that still have thick textures like part-skim ricotta, Greek yogurt, light sour cream or reduced-fat cream cheese. If you're vegan, or you're just looking to lighten up your dairy intake, try cashews pureed with a little vegan milk, or water, until they're super smooth — they provide a delicious creamy texture and taste, and will help thicken up all types of sauces.